Several of us arrived a week before the beginning of the summit in an effort to help prepare for the blockades on June 1st. The aim of this brief analysis is neither to point fingers at anyone nor to provide an opportunity for mutual back patting, but only to try to provide a reasoned summary of our feelings about the week or so we spent in Lausanne. the solidarity on June 1st was inspiring to see. For a day, at least, we managed to escape from the stifling dichotomy between 'bad' and 'good' protestors (maybe all the 'good' protestors were marching about in Geneva) and just support each others struggles. We will not soon forget the feeling of the Pink/Silver bloc marching towards the massed ranks of the Grey/Black Bloc on Thursday and being greeted with cheers and raised fists. Neither will we forget the solidarity among the 400 to 500 protestors trapped in the Bourdonette camp by the police; the interchange of anti-police slogans in five or six different languages was empowering and educational at the same time. As well as the solidarity between different tactical approaches, the shared desire to DO SOMETHING about the G 8 was intoxicating...no-one at the c'village or Bourdonette wanted to march around ineffectually; everyone wanted to shut the summit down, no questions. However, despite the many positives that emerged from our shared experience in Lausanne, there can be no doubt that there were also problems, some serious, which need to be addressed if we are to move forward effectively and build the new world that is so desperately needed. One of the main problems in Lausanne was that (it seemed) there had been very little work on any kind of tactical plan for blockading the G8, despite the fact that almost everyone who came to the city came for that reason. Understandably, the local activists had spent much of their energy establishing and defending the squatted "c'village", and as a result there was very little idea of how the G8 would be confronted or what options existed for new arrivals. This problem was exacerbated by a schism within the Lausanne activist scene. 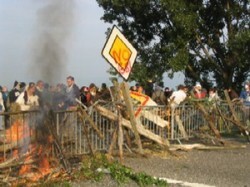 The OSL (libertarian socialist organisation) had essentially decided a few weeks before the G8 summit that it would entirely dissociate itself from illegal protest (including the blockade of the summit) due to worries about police persecution after the event. This put even more organisational pressure on those Lausanne activists who did favour blockades, as they were now responsible for defending an illegally squatted village AND blockading the delegates. While the attitude of the OSL can be explained by an understandable desire not to be smashed by the authorities, it again points to the fact that it is difficult to trust any organisation/social forum/established union that has something to lose. We have to be prepared for these sorts of retreats to occur, and not let them destroy our entire capacity to organise. This problem extended into the village itself, which sometimes displayed difficulties in realising the laudable concept of self-organisation. There has to be some kind of existing structure for new arrivals to plug into; at the very least a scheduled camp meeting once a day and easy routes through which to getting involved in organising. As it was, the 'self-organising' concept turned into an informal hierarchy of the most informed and most confident; not something that we should be encouraging. This is not, of course, to suggest that self-organisation automatically leads to either hierarchy or chaos; only to point out that in such situations, if no effort is made to include new arrivals then anarchy can rapidly deteriorate into oligarchy. It seems that it is time, once again, to direct people to "The Tyranny of Structurelessness" as an object lesson in why disorganisation is not the same as non-hierarchical organisation. As it was in the village, so it was in the tactical organising. Unsurprisingly, when confronted with the lack of any coherent plan for blockading the G8, the most well-connected and energetic activists hurled themselves into formulating one. However, due to the lack of any defined method of getting involved in the planning, most people in Lausanne found themselves entirely in the dark as to what was going to happen on the day of blockades (June 1st). It was only on the night before that people found out that there was any kind of plan at all, and by that time many had already left in confusion. The confusion and paranoia over who was to be trusted led to only those people who had been actively involved for several days and who were confident enough to thrust themselves into organising roles being consulted. This process reached its pinnacle (or nadir, depending on how you look at it) with several 'secret' evening spokescouncils on the days leading up to the blockade, which brought some of the more solid affinity groups and blocs together to hash out a tactical plan for the city. Needless to say, this kind of organising is NOT the ideal for an anti-authoritarian movement, and led to many people feeling either alienated or simply being unaware that there was any planning going on at all. The problem with tactical planning was not caused, however, by the ill-intent of those hard-working people who threw together a plan and did their best to include others. It was mainly caused by the fact that the organisational process that was used didn't take into account the fact that most of the people wouldn't turn up in Lausanne until the day before the blockades. In this circumstance it was simply impossible to include everyone in the sort of planning that was used, or even to make everyone aware of what the plan might be. Most people just ended up following the largest bloc, having had no part in formulating its principles of unity (in many cases, not even being aware that it was a coherent bloc or that it HAD principles of unity). Forms of organisation such as spokes councils, which require strong affinity groups and prior training to work effectively, were extremely difficult to run on the ground, due to the impatience of people who were not included in the process or didn't see the need for it. If we truly want to be inclusive and democratic, we need a different tactical planning and organisation process that takes into account the inputs of the people turning up the day before the demonstration. We cannot base our planning process on the assumption that people will come a few days in advance, since we realized in Lausanne that this is simply not the case. We can indeed encourage people to come in advance, but we also have to define new processes that will not use this assumption as a starting point: this is a great challenge for non-hierarchical organization, but it is a fair challenge that should be addressed with concrete proposals. The lack of numerous strong affinity groups led to a real problem in the Pink/Silver bloc; several affinity groups that were TOO strong. We are willing to hold our hands up and admit that the Oxford affinity group drove a lot of the decisions that were taken in the days leading up to the blockades; we facilitated a large number of the meetings, we drafted the principles of unity, we suggested roles for others to take up. We even facilitated the creation of other affinity groups, to a large extent! We would have been much happier if there had been several other strong affinity groups present in the week leading up to June 1st. It would have helped spread responsibility and would have made the Pink/Silver bloc much more pluralistic, as well as enabling us to get some much needed rest! Unfortunately, as the planning process relied exclusively on the people on the ground and that most people didn't arrive in Lausanne until the day before the blockades, we were forced to take on a leadership role that we would have rather avoided. But again, the problem was not only that there were not enough strong affinity groups (although it would of course have helped if there had been), but rather that the way the organisation worked wasn't adapted to the fact that people wouldn't come in strong affinity groups. While we can encourage people to come in affinity groups, we also need to define and implement non-hierarchical structures and communication tools to disseminate information and empower people who are less experienced in organising protests; and these structures should not be based on the assumption that people will come in strong affinity groups, which is simply not the case presently. As a result we can infer that a planning and organisation process relying only on a spokescouncil structure is not adequate to the present situation and should be refined to be more inclusive and democratic. If we want to make horizontal organising more effective, we have to provide new non-hierarchical structures and processes to make sure that the differences between individuals (differences in personalities, experiences and concrete situations, like being part of an affinity group or not at the start) are not increased by the very process of organising. Another example of this problem arose on the day of the blockade itself. The enthusiasm and energy of the bloc was augmented to a great extent by the London/Amsterdam samba band, who provided great rhythm and drive throughout the day. Unfortunately, however (and this should not be seen as a criticism of individuals, it's just what happened), the samba band had arrived the night before the blockades and had not been involved in the formulation process of the Pink/Silver bloc. It already had its own decision-making processes and spokes council, and apart from one liaison member (who generally told the P/S spokes council what had been decided by the samba band, and didn't take part in the P/S spokes council), didn't take part in the Pink/Silver process. Of course it is every affinity group's right to make autonomous decisions, but it becomes more difficult when that affinity group is the samba band. As everyone knows, the samba band is the force on the ground that everyone follows...if it is making its own decisions about where to go without consultation with others, then any other form of spokes council is rendered pointless. Essentially, the samba band became the sole decision maker for the Pink/Silver bloc, and short-circuited the input of all other affinity groups. This was not their fault; it arose because we had designed the decision-making processes of the Pink/Silver bloc without input and knowledge of how the samba band wanted to operate. It comes back to the same problem as above: our planning procedure must take into account the input of everyone willing to be involved in the organisation of the demonstration, not only of the people there on the ground a few days before. Democracy and efficiency require this. The frustrating thing about so many of these problems is that they did not arise because of bad intentions or political differences. They arose, simply, because the planning, organisation and decision-making processes were not adequate. This inadequacy, again, allowed those with the most information and drive on the day to dominate decision making processes; not because they were somehow trying to dominate, but because _somebody_ needed to take responsibility. Of course, we should not forget the positives that came out of Lausanne. The energy and desire to change the world that we felt during those days, and especially on June 1st, will stay with us for a long time. It is that shared desire to do something, however, that prompts the criticisms we have made above. We cannot cede this movement to authoritarians and passive liberals; the causes we're fighting for are too important for that. The only way that we can keep the anti-authoritarian, militant approach to politics alive is in making it easier for people to get involved. To drop cliquey, 'who you know' politics, and to do our best to include everyone who wants to make a difference. This doesn't mean abandoning non-hierarchical approaches, it just means making a constant effort to make them work better. Similarly, those people who want to get involved are going to have to devote the time to do so; we cannot outwit thousands of police armed with teargas and tanks with a couple of hours planning. If we're going to continue to contest these summits of the rich and powerful - which we think is important, alongside local grassroots action and alternative building - then we should do it properly. There's nothing worse than feeling that you can't win even before you start. There is nothing shameful about organisation or efficiency; it's the only way to provide for everyone, and not just the most confident or most connected. 1. At the camp level, institute a few basic routines and schedules. Have at least one camp meeting a day, which is open to everyone and run on consensus. Make it very clear what the structures of the camp are, when and where the meetings are and how people can get involved and help out. 2. If possible, try to come at least three days before the summit begins. 3. The planning process should be inclusive and not exclusively rely on the people on the ground. A possiblity would be that the process starts a long time in advance, say one month before the summit, through local face-to-face meetings and web-based inclusive participation means. The first part of the planning process could used web-based decision-making procedures, similar to the functioning of many indymedia centers. The big issue with this is to ensure security in the web-based part of the planning process. New means and ideas of communication through the web, which would be entirely secure while still user-friendly and accessible for all, have to be clearly defined. 4. If it becomes obvious that setting up the camp and legal aspects of the convergence are going to take up a lot of the local activists' time, at least set up process and procedure for tactical planning. Provide the basic information with which people can make tactical decisions. 5. Take regular soundings of what people are feeling. Provide a space at which people can make their complaints without having to direct them at an individual in a personal attack. If this had happened in Lausanne, many of the people who left thinking that nothing was going to happen would doubtless have stayed. 6. Implement a concrete non-hierarchical structure to disseminate information and empower everyone willing to help so that no informal leadership of the more informed and more confident occurs. An idea could be that the planning process is divided in some general "themes" defined beforehand (maybe through the web-based decision-making procedure, say process, strategy, communication, camp, prop making, etc). Then, in the convergence point (the camp for example), each "theme" has its own convergence point (a tent) where an "info person" is *permanently* there (all the roles should be rotated between volunteers already involved) to explain what the "theme" really is, what has to be done, and how to be involved. There would also need to be a "welcome point or tent" with a "welcome person" *permanently* there (again in rotation) giving a brief summary of the situation to new people, explaining the different themes of the planning process and directing new people to the tents of the themes in which they are interested in. In this way the information wouldn't stay in the hands of a few people and it would be very easy for everyone, even for the non-experienced and not-very-confident, to get involved and to get the information they want about whatever part of the planning process they are interested in. It would also give the possiblity for everyone to have a rest (during the time spent at the info tents) while still being very useful to the whole planning process. 7. The 'theme' tents and 'block' tents would be responsible for providing a summarry of who they are and how people can get involved, which would then be placed on a regularly updated information board in the main welcome tent. 8. The above ideas can, of course, be modified and refined to take into consideration any security or transparency concerns which may arise. We only want to start a discussion on how we can best involve everyone in the organisational process. 9. Another issue is how to balance security concerns with transparency. This is doubtless much MUCH easier when people are formed into affinity groups with people they trust. Do your best to come in an affinity group, and participate. In this way we can eliminate the kind of 'secret' meetings which occurred in Lausanne and which we would do well to avoid. However, the planning process should not rely on the assumption that people *will* come in affinity groups. If the above suggestions seems obvious, then it should be remembered that we are only making them because a lot of this DID NOT happen in Lausanne. As a result, we simply did not involve the majority of protestors in any kind of decision-making process. This is not good for democracy and its not good for empowerment...we need to keep pushing forward and trying to do better, if we're going to win.